Late summer’s when you see ‘em, but now’s not actually the best time to mess with a bee or wasp nest. 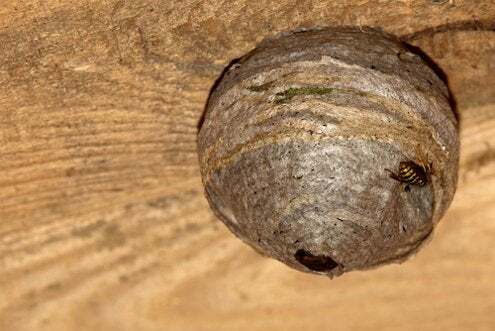 The queen establishes her colony in june, but you don’t always know a nest exists until it gets bigger and you see insects coming and going into holes in the ground, in trees or in your house. “Late summer’s when you see ‘em, but now’s not actually the best time to mess with a bee or wasp nest. The queen establishes her colony in june, but you don’t always know a nest exists until it gets bigger and you see insects coming and going into holes in the ground, in trees or in your house. If the nest isn’t near where people hang out, you can probably let it be, at least until the temperatures get lower. Below 50 degrees, wasps can’t fly well, and when it freezes the colony will die. Nests that are hidden in walls or attics are hardest to control. Insecticidal dusts generally work better here than aerosol sprays. For yellowjacket nests in the ground, try pouring in a soap and water solution. Whatever you use, do it at night when they’re not active. It’s interesting that porch ceilings were traditionally painted sky blue to keep bees and wasps, who prefer to nest under cover, from feeling at home. Some old-timers say the same trick works on the backs of attic louvers and shutters. If you’ve had bee problems, it’s certainly worth a try!